Mattress toppers literally sit upon the top of your bed. They may add a level of support your traditional mattress doesn’t provide. They may even out a sagging mattress, extending its life without sacrificing comfort. Or they may make a bed softer and warmer. Mattress toppers come in a variety of materials and sizes. 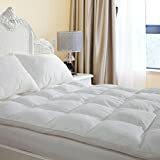 Let’s review your options when it comes to mattress toppers before recommending the top seven mattress toppers to cover nearly everyone’s needs. Mattress toppers may be made from memory foam or gel. They may be made with generic foam akin to the egg carton style of foam used in packaging furniture or natural fibers. Latex is often used in place of foams due to its low cost, but it brings the risk of allergic reactions for some. Mattress toppers are often used with down from birds, feathers or a mixture of feather and down. These products are not a good choice for animal rights activists. Wool is a popular option for mattress toppers since it keeps you cool in the summer and warm in the winter. Wool is safe with vegetarians, since the sheep are not harmed by shearing, though vegans still avoid this in favor of natural fibers. Mattress topper thicknesses depend on both the manufacturer and the material. Down filled mattress toppers are luxuriously soft while being very thin, while feather filled ones take up a lot of space. In terms of dimensions, mattress toppers are typically the size of your bed. This is why those shopping for a mattress topper need to know the size of bed it will fit on. The smallest commonly available size of mattress topper is twin size. Note that you can put a twin size mattress topper on one side of an Eastern King size bed. A twin XL length bed topper fits over half of a king sized bed or fits over a standard twin XL mattress. You can find mattress toppers to fit full, queen, king and California king mattresses. King sized mattress toppers may be called “standard king” sized to differentiate from the California king mattress. The best mattress toppers come with stretchy skirts to help hold it securely to the top of the bed, but some simply lay on top of the bed. This memory foam mattress topper is priced middle of the market for this type of product. It is often available on sale. Its greatest benefit is eliminating pressure points that cause pain for those with sore backs or arthritis. The memory foam is ventilated, eliminating the problem of overheating when you’re tucked in under several blankets. The memory foam itself contains a gel that helps capture body heat. 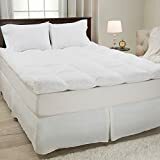 It is very soft and responsive to movement.It fits a standard 60 inch by 80 inch bed, and the entire mattress topper is only three inches thick. 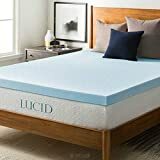 This mattress topper rivals the LUCID brand topper at full price but is sometimes marked down to a lower price when on sale. One of the benefits of this model is that it is thinner than the LUCID model. It is lighter, partially due to the thinner layer. It has a slight smell from off-gassing like conventional memory foam products that fades over time. Unlike others on this list, it can be trimmed to fit unusually sized surfaces like an RV bed. It fits on sleeper sofas and futons just as it is. This mattress topper is perfect for keeping you comfortable year round. It comes at an affordable price for wool mattress toppers. The main attraction of this mattress topper is the fact that it is completely washable. Another benefit of it is the fact that it comes with anchor bands to securely hold it down to the bed so it doesn’t shift at night when you toss and turn. If you are getting warm at night, you can flip it over to expose the cotton size. The mattress bands work that way, too. And at only four pounds, that isn’t hard to do. Despite the company name, Duck and Goose Company, this mattress topper was made without harming any animals. It uses alternative fibers instead. There is no smell as you find with foam mattresses. And it is only two inches thick. The square stitching of the mattress topper is supposed to hold it in place. The channel weave design is intended to provide air flow so you don’t overheat. One of the benefits of this model is the fact that it is machine washable. Another point in its favor is the fact that the anchor bands can fit any mattress from six inches to twenty two inches. Yes, this will fit over the box springs and some water beds. If you’re looking for an affordable yet traditional mattress topper for your bed, this is the one for you. It contains both down and feathers while only being four inches thick. It is luxuriously soft and wonderful to lay on. It weighs just under fifteen pounds. It doesn’t need to be fluffed up very much, unlike some of its rivals. But if you want a down and feather topper that doesn’t need to be re-fluffed, you’ll be paying five times as much. The only downside is that it doesn’t attach to the mattress, though the bulk means it won’t shift unless you’re sliding into bed. This unique mattress topper consists of two foam layers. One layer is made from conventional memory foam. The second and top layer contains green tea extract (hence the name) and castor seed oil to naturally kill odor causing bacteria. If you often end up sweating heavily in bed or experience biological messes, staining and stinking up a mattress, this is the mattress topper you want. It has a limited five year warranty. The only downside is that it doesn’t come in all mattress sizes, though you can easily find it for twin, full, queen and king beds. Are you torn between the benefits of foam and a fiber mattress topper? This mattress topper by Sleep Innovations costs more than the others on this list, but you get more, too. There is a memory foam layer covered by a two inch fiber filled layer. It provides a machine washable cover to keep the two layers in place. The entire thing weights nearly thirty pounds but it won’t need to be fluffed, flipped or shifted back into place.